“Unknown rider breaks Moser’s record” was the headline in german newspapers. 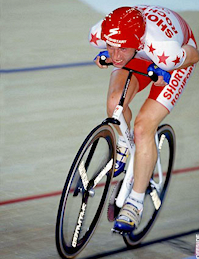 Outside Great Britain Graeme Obree was really almost unknown. But that changed when he improved the legendary mark of Francesco Moser. Maybe even more sensational was his selfmade bike and his extremely aerodynamic position. Research showed that with this position one could ride 1-2 km/h faster. It is remarkable that his first attempt on Friday night was a failure, but immediately on failing to set the new world record, he asked the officials if they would indulge him another ride. So on next morning on 9:00 he set of again, this time towards a new world high. 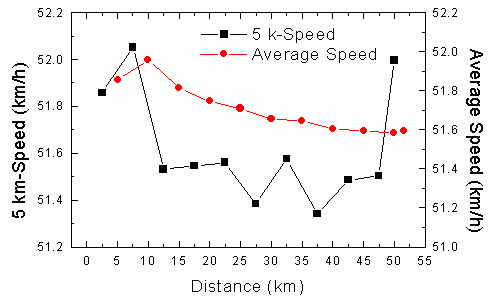 After the first very fast 5 km with more than 52 km/h he slowed down to about 51.5 km/h, sometimes even lower. But the average speed was always well above Moser’s record.